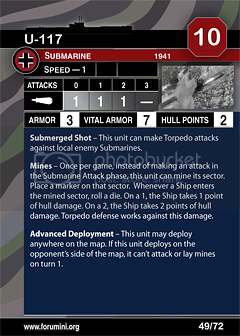 The first submarine to have mines, and through advanced deployment can bring out its mines early. For the most part, you’ll want to deploy to the center rank as is typical with most infiltrator submarines. You may then mine an objective or the approach to an objective on turn-1. 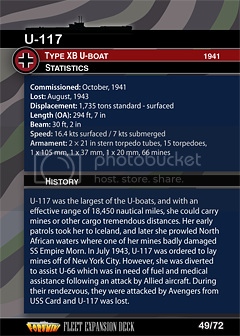 The U-117 possesses high vital armor, and its hull is much stronger than the typical low end submarine. It does possess only a single torpedo at all ranges. There is no incentive or need to close ranks, and you also do not lose any die to suppression unless you’d pick up a boost from a Kondor. Perhaps the main advantage of a U117 is how the mines will affect an opposing destroyer swarm. First, consider that most destroyer swarms hit the objectives quickly, and sometimes roll into the objective with three ships, all of which make mine rolls. Second, the damage against those destroyer swarms is slightly stronger than a torpedo against a battleship. As with a torpedo, you have a 1 in 6 chance of outright sinking the destroyer. You also have a 1 in 6 chance of crippling it. More importantly, you won’t generally worry about suppression since you’ll find yourself throwing a single torpedo die regardless. Thus conceivably we could put 5x U510/66 and 2x U117 into a submarine swarm and have the chance to mine a couple of objectives early before backing off. Combined with whatever air we’ve brought, whatever surface fleet, and whatever damage our torpedoes might do, we’ll have improved chances against that destroyer swarm. Our plan is to sink their surface fleet, and take the remaining un-mined objective.